PDF stands for Portable Document Format. Developed by Adobe in 1990 with PostScript programming language, the PDF format file wraps all the components (text, images, vectors, etc. ), which are necessary to display the document in a single layout. It is easily shareable with no operating system limitation, on which you would want to open the file. It offers higher level security to documents compared to other formats. Platform independence, free viewer applications, password-protection, etc. are some other attractions of this format. Encryption: PDF creator applications allow encryption of PDF files. This means that unauthorized people cannot edit, modify, print, or copy these documents. Hence PDF format increases the security level of the document. Portability: PDF format can be accessed in different operating systems like Windows, Unix, and Mac. Also, it is easy to transfer PDF documents over a network, through mail, or using some storage devices. Free reader applications: Adobe distributes Adobe Reader free for viewing PDF documents. Also, most of the web browsers support opening and viewing PDF documents. All the digital documents are vulnerable to virus attacks and get infected by the influence of malicious content, and the same applies to PDF document files. Knowing how and when the PDF file becomes corrupt and inaccessible is not possible because multiple reasons can lead to such an unexpected outcome. Below are a few causes due to which a PDF file document might turn corrupt or get damaged risking the information stored inside. So, how would you repair a damaged PDF document? The question remains, we’ll discuss this below in this article, but before jumping to that section, let’s shed some light over the causes. In cases like, when both the USB storage media and the hard drive fail, it would result in PDF document corruption. The hard drive or storage media failure can occur due to many reasons behind, for example, an electrical short circuit, excessive hardware heating, exposure to water, etc. While transferring the file from one PC to another via a USB drive or cable, the chances of PDF file corruption exists due reasons like direct ejection of storage media from the system without initiating the eject command from the system tray or sudden removal of transfer medium before the transfer was complete. As a result, the receiver may get an incomplete or useless PDF document. Improper system shutdowns and power failures can interrupt file transfers and downloads, and can corrupt the PDF files. So, how would you repair corrupt PDF files? Well, there are different approaches which you can take. If you’re dealing with a similar situation like above, then before thinking about anything else, you should consider checking whether the programs that are used to read these PDF documents are working fine or not, for example, Adobe PDF Reader, Adobe Acrobat, etc. And if the issue persists in the reader programs then consider trying a new third-party PDF Reader, it would likely help you towards the resolution. If you have the PDF file on your Windows 10 machine, then you can make use of the backup utility that comes built-in the OS. For accessing the utility press (Windows), select Settings and navigate to Update & Security > It is good practice to enable the Backup utility for safety. In case if you’ve not enabled the Backup function, then doing so would save you from future risks of file corruption or damage. And if the Backup Utility is already enabled on your system, then you can use the File History feature to recover the PDF file from its previous version. Browse to the location/path where the corrupt PDF document is saved. Restoring files to previous points can save you from starting from scratch. But what resolution would you think in situations when you’ve tried all the workarounds already, but nothing proved to help. Opting for a professional tool that tackles such a problem would be the best thing to consider. 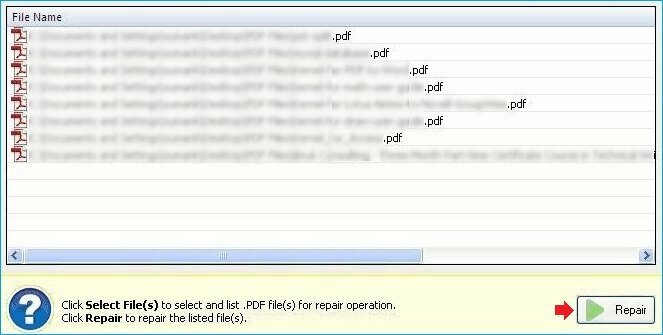 How to repair corrupted PDF files easily? Kernel for PDF repair helps users to recover and repair all the corrupted PDF files. This tool performs complete PDF file recovery with no loss of data. And using this tool, users can repair multiple PDF documents at the same time. Open the Kernel for PDF repair tool. The home page of the tool appears. Click Select File(s) and choose the PDF file(s) you want to repair. After adding all the PDF files for repair, click Repair. Wait till the repairing process is over. Click OK when the software displays a confirmation message. You can encapsulate text, image, vectors and so much inside a PDF file document. With PDF files, it is easy to carry information. Kernel for PDF Repair is the best solution for the call of PDF file corruption. Using the tool, you can repair the file or recover the data very quickly.